The Airgate Centre, formerly Taj Mall, situated along North Airport Road. 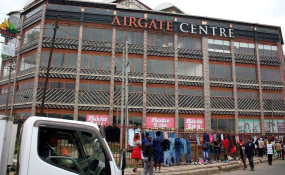 The owner of Airgate Mall, formerly known as Taj Mall, has been directed to bring it down by August 30 or face the government's demolition squad. Tenants at the mall have also been asked to vacate the premises to pave way for the demolition of the building. A notice issued on Wednesday by the chairman of the multi-sectorial Committee on Unsafe Structures said developers of the shopping mall encroached on the road reserve and wayleave, hindering the continuance of construction of the Outer Ring Road. "Notice is hereby given to the owner/developer of the illegal development namely Airgate Mall, formerly known as Taj Mall situated at the North Airport road at the junction of Outer Ring Road. The owners/developers are asked to remove this illegal development before 30th august 2018," said Mr Moses Nyakiongora. He added: "Upon the expiry of this notice the illegal development will be demolished or removed from the road reserve and wayleave at the owner/developer risk and cost." The building was earmarked for demolition in 2016 to pave way for the expansion of the Outer Ring Road but got a reprieve from the National Land Commission chairman Mohammed Swazuri, who argued that it does not stand on land needed in the expansion of the Outer Ring Road.